One of my favorite things about this time of year is all of the time spent with family and friends. Between tailgates and football games and the upcoming holidays, there are so many opportunities to spend time with my favorite people. Of course, parties and gatherings are so much better with good food. Party food makes hanging out with your favorite people even better. And it shouldn’t be something you have to stress about. Whether you’re the one prepping the party snacks or eating them, they should add to your party experience, not take away from it. 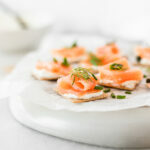 That’s why these easy 5 ingredient smoked salmon bites are perfect for all of your get-togethers this season! These delicious appetizers take only 10 minutes to make, but taste like they took hours. 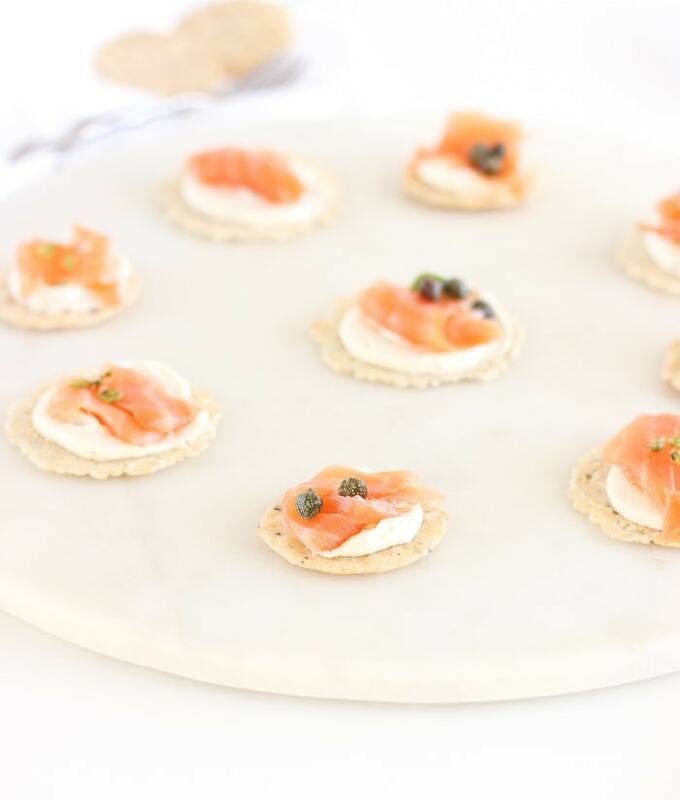 All you have to do is mix together the delicious herby cheese spread, spread it on your favorite crackers and top them all with a bite of smoked salmon. They’re that simple! I love using seafood in my appetizers. Not only is seafood so versatile, but it adds so much flavor and protein to snacks in no time. From crab to shrimp, to salmon or tuna, there are so many seafood options to enhance your party spread. 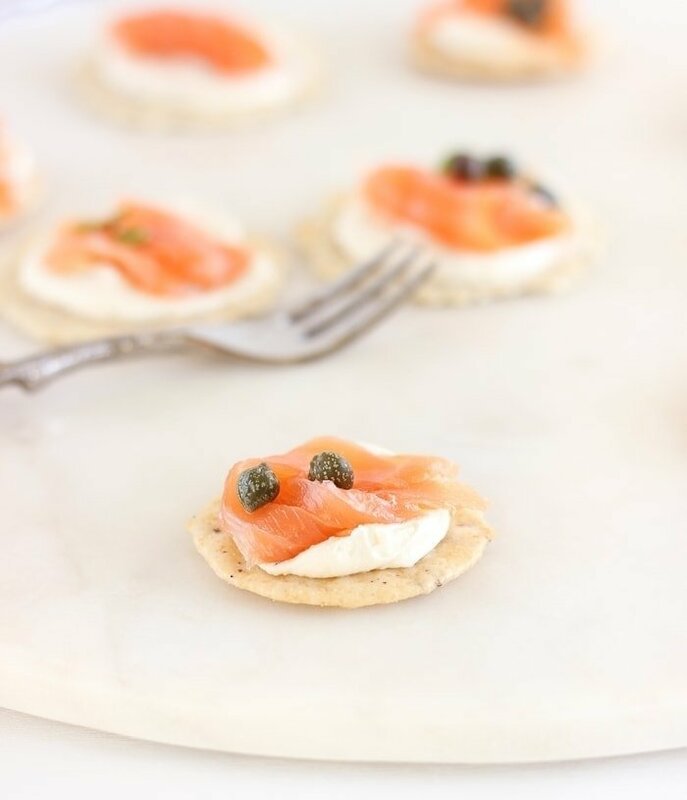 This particular appetizer is loaded with flavor thanks to a delicious garlic herb cheese and smoked salmon, as well as protein and omega-3s. They’re nutritious and perfect to share with all of your favorite people over a glass of wine and great conversation. Enjoy! Whisk together garlic and herb cheese, cream cheese and milk until smooth. Scoop into a plastic zip-top bag, zip closed and snip on bottom corner. Pipe about a half teaspoon of the cheese mixture onto each cracker. You may need more for larger crackers. 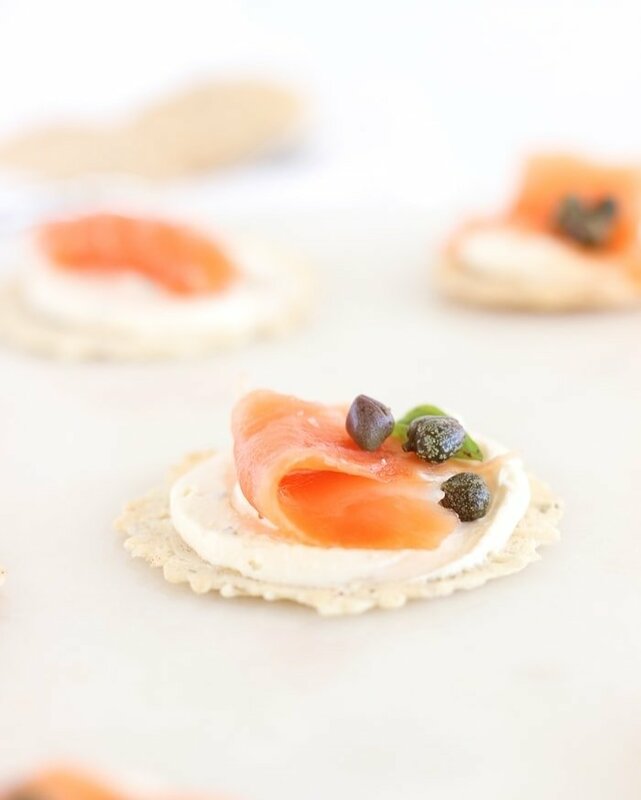 Top each cracker with a piece of smoked salmon. Garnish with capers or fresh herbs (optional). Serve immediately, or refrigerate until ready to serve.